Well, on Valentine’s Day, I went back under the knife. My surgeon decided to remove two of the three screws that are holding my leg together. Apparently, they were not holding it quite right, so the edges of the broken tibia were too far apart to heal properly. Apparently, the operation didn’t go as smoothly as they would have liked because my doctor didn’t have the right attachment for them. If you look closely, you will see they require an allen wrench to remove, but I guess American surgeons don’t buy their surgery components at Ace Hardware. It’s a good thing I was unconscious at the time. I don’t think anyone wants to hear their doctor saying *&%#@#$% in the middle of your operation. They gave me the two screws as a souvenir (or consolation prize?). 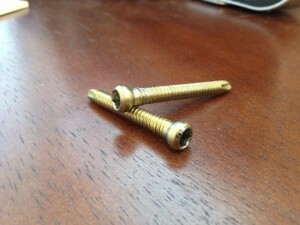 My son-in-law, Ryan, pointed out these are self-tapping screws, typically used on sheet metal. But apparently, in Italy, they use them on bones too. Steve: They took out 2/3 of them. That means I only have one screw left in me. Marge says it better be a really good one. Marge: I don’t know why he is saving that last screw….not getting any younger here! I suppose we could say that in this case, your doctor didn’t screw you!